This past weekend was pretty packed with things to do. Saturday I had to do a ton of cleaning to make room for our Christmas tree, which I planned to get on Sunday. In the afternoon, we had plans to go watch UFC 107 down at Giovanni Pastrami’s because we have two coupons for a free any size pizza that expires at the end of the month. On Sunday we had a birthday party at Chuck-E-Cheese to go to. After that, the kids were still awake, so we switched cars and headed out to Mililani to find a tree. Eventually everyone fell asleep but me and I ended up driving around Mililani, Pearl City, Waikele, and Aiea for over an hour, trying but not succeeding in finding a tree. We gave up and went home and then I found out that Oahu has a Christmas tree shortage again this year. I remembered reading about a tree farm last year in Wahiawa and so called up Helemano Farms to ask if they still had. They did, so I booked it out to Whitmore Village as fast as I could because they close at sunset and eventually came home with a small 5 foot Leland tree. It cost me 50 bucks, but I got a tree! We decorated it and I took the kids’ Christmas picture. I had to pull out half my hair, lose my voice, and threaten pinching, but I got a nice one. I thought I’d do a Christmas tree bento after my long ordeal, but I couldn’t find my tree cutter. Boooo! Anyway, I dug around until I found a cute snowman I’d never used before. I ended up making myself a Frosty the Snowman ham sandwich. I’m starting a new contest today, so read on for the full details! My sandwich has only one slice of bread, so that I cut down on the carbs. Not that this matters since someone brought in caramel macadamia nut brownies to the office today. 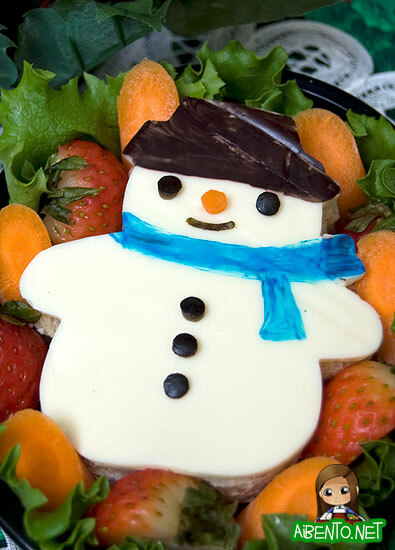 I started with Frosty, cutting him out of a slice of white cheese. His hat got cut off, so I used a scrap to finish it up. I used my Edible Color Markers to do the scarf and hat, but these pens aren’t very good with coloring shiny cheese like these American slices. I find them very frustrating to work with, especially since my red pen was dried up!!! Grrrr!!! I used slices of olive for the buttons and eyes, cut with a piece of drinking straw. I figured they look a lot better than nori since they have texture and I wanted to do the same for his mouth, but there simply wasn’t enough room, so his mouth is cut from nori. His nose is a slice of baby carrot cut with the same straw. 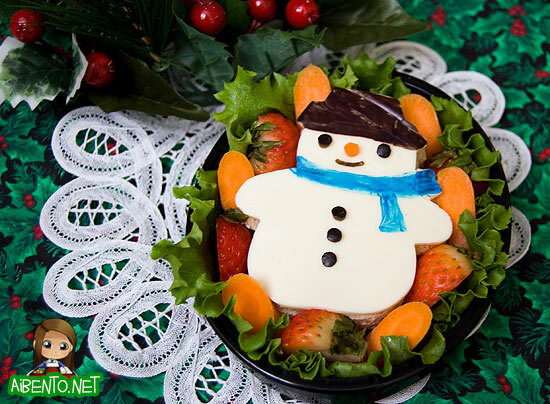 I surrounded Frosty with sliced baby carrots and strawberries. The other day, when I was giving the kids a bath, Baby Girl started singing the Twelve Days of Christmas. It’s one of my favorite songs to sing, provided it’s the Hawaiian version. Here’s a video with the song. I couldn’t remember days 9, 10, and 11 though, so I had to go look it up. Anyway, that brings me to my contest. I have a bag of extra unopened bento stuff that I need to get rid of since I’m doing a purge cleaning for 2010. I have 11 things and will go find a last item to throw in for the 12th prize. To enter, you have to comment on this blog post with at least one line from the song Twelve Days of Christmas, but with bento items or foods instead. If I choose your line for the song, you win one of the prizes! If you want to submit all twelve days, that’s fine, but you can only submit an entry for each day once. So if you submit for the “Fourth Day of Bento”, then you can’t submit for the Fourth Day again. If you submit all twelve lines, that’s twelves chances for you to win! Each person will be able to win a max of two prizes from the pool. If two people submit the same entry for the same day, I will choose whichever has either the better sound or if they’re completely identical, whoever posted it first. This contest will be open worldwide and will end December 18, 2009. Prizes include bento boxes, onigiri molds, food picks, and some other things. Prizes will be chosen at random and sent as a “surprise” gift. Please do not submit your addresses with your entry. Please DO leave your email address so I can contact you.